Jason Middleton, center, founder of Silver Air, rides up Gibralter Road in the 2015 Santa Barbara 100 bicycle ride. Bicycle enthusiasts hope to raise $100,000 for Santa Barbara nonprofits with a ride that recently got a redesign. The Santa Barbara 100 has grown to four courses this year and hopes to bring in riders both amateur and professional with offerings like the Flyer’s Club it debuted in 2015. Along with title sponsor Silver Air, the private charter jet company started by her husband Jason Middleton, the event is concentrating on business partnerships and a “VIP” experience, netting contributions from companies like Tesla, Clif, Primalwear and New Belgium Brewing. Located close to the start and finish lines at Leadbetter Beach, the Fess Parker Doubletree hotel is also a sponsor and offered promotional rates to riders. Originally called the Santa Barbara Century, the ride has raised around $280,000 over the last five years and raked in $79,000 last year. Funds from the event support youth bike programs, scholarships and organizations that offer services to families grieving the loss of a child, including Cottage Children’s Medical Center and a foundation created by the Middletons. Riders can choose between 100-mile, 34-mile and 100-kilometer courses. 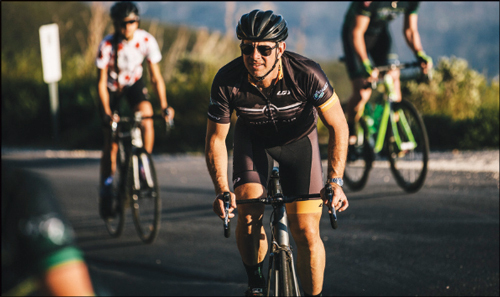 A recent repaving of the Gibraltar climb and a partnership with Gibraltar Wealth Management helped the organization add a competitive edge to the ride — a time challenge along the 7-mile Gibraltar climb, with a gain of more than 3,000 feet in elevation. Previously only open to those doing the 100-mile course, it has been added to the 100-kilometer course, expanding it to riders at all levels, said Ed France, executive director of the Santa Barbara Bicycle Coalition. The last two years there were about 1,000 participants, Middleton said, with nearly half local to Santa Barbara and almost 80 percent over the age of 35. This year, a digital marketing push has focused on increasing statewide attendance and hopes to provide measurements of attendance and tourism spending. The group also published a trolley schedule and walking maps, promoting areas of interest for visitors who want to extend their stays. The Central Coast is home to the Amgen Tour of California and hosts legs of the Arthritis Foundation’s California Coast Classic Bike Tour and the AIDS/LifeCycle benefit ride.